1) Thou shall only pet, soothe, and share soft energy with a dog when they are in a healthy and positive state of mind. What you pet is what you get! So be mindful to use your interactions to cultivate positive mental states rather than negative. Instead of coddling and soothing your dog at the first sign of distress, let’s learn to ignore minor stress and moments of uncertainty. Trust that your dog is a creature designed to overcome challenges, and that she is much more resilient than you give her credit for. Like kids, your dog will take cues from your level of reaction as a guide for how strongly they should feel and be concerned about situations. For more serious behavior issues, embark on a balanced obedience/training program which will instill confidence and growth. With the right training approach, even serious issues can be successfully tackled. Check out my basic free how-to videos HERE or my Foundation DVD HERE. So think of it this way: if there’s a behavior that you would like your dog to do less of, don’t do something that will increase the frequency of the behavior (petting, soothing, etc), and instead do something that will reduce its frequency (ignoring, correcting, or training). 2) Thou shall keep your on-leash dog safe by not allowing interactions with unknown dogs, who are also on-leash. We learned in the previous post that dogs meeting on-leash tend to be in a compromised state, either due to stress from excitement and frustration of anticipating a meeting; or stress from nervousness and insecurity from trying to avoid a meeting (and, of course, some dogs are conflicted and vacillate between both). Either way we know that even really social dogs may end up in a negative interaction when on-leash due to these factors. So what’s the right approach to dogs meeting on-leash? Most of the motivation behind our desire to have on-leash meetings stem from our belief that our dogs need to meet every dog they see. That in order to be fulfilled and happy, they need to have interaction with all the neighborhood dogs. Believing this to be the case, and, of course, wanting our dogs to be happy (and not wanting to be a social outcast who says ‘no’ to other owners), we allow them to drag us over to random dogs at their discretion and peril. But the reality is that your dog needs structure and guidance from you on the walks much more than he needs to meet every dog in order to be happy and balanced – not to mention, safe. Remember that it’s our job to advocate for our dogs and to keep them safe, sound and balanced when on-leash and off. Simply put, your dog needs you to make the smart decisions and understand what’s best for him when it comes to safely navigating through our world. 3) Thou shall ensure that your dog waits patiently at thresholds, heels politely, and obeys the rules of the structured walk. Previously we learned that allowing these behaviors oftentimes creates relationship issues, teaches your dog to ignore you, trains pushiness, and often creates stressed out little monsters. So let’s not go there! Instead, focus on creating respectful, calm behavior at thresholds with your dog stopping and waiting for permission from you to move through. This simple exercise can dramatically change your dog’s behavior on the walk and elsewhere. The trick is to not use a tense leash to hold your dog back from moving through the threshold, but, instead, use a quick pop on the leash if your dog should try to move past you. You can also ask your dog to sit first, but the way I do it, without a verbal command, actually challenges the dog more and encourages better focus and more respect. Same goes for the walk itself. Many owners use constant pressure (holding the dog back with a tense leash) in an attempt to control the dog. This only makes for a tense, frustrated, struggle for both of you. What we’re looking for is a short, but not tight, leash, that always has a little slack in it, except for the moments when you correct with an instantaneous leash pop and release. These leash pops are conversations to your dog that communicate where your dog should be position-wise. Also, see my post called Why Heel Matters. When done correctly, the structured walk (with relaxed leash and using leash pops to communicate) will keep your dog from pulling, keep him/her calm, and will prevent many of the outbursts and reactivity (barking and lunging). These outbursts typically come from dogs being overly-stressed due to straining, frustration, and feeling disconnected from you. As for the actual rules of the structured walk, don’t allow your dog to pull, sniff, mark, or target other dogs. 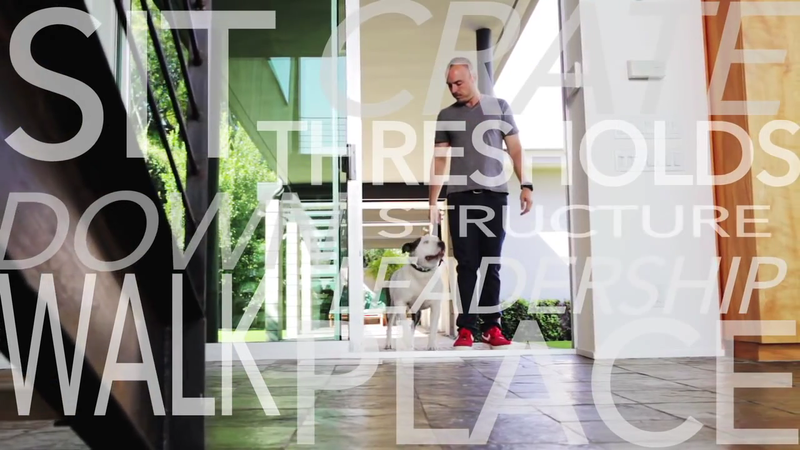 Your dog needs structure and rules from you in order to feel comfortable, respectful, and safe on the walk. You can allow your dog to have potty and sniff time on your release, not when your dog simply decides to pull you to something of interest. Owners often struggle with feeling bad about asking their dogs to walk in a more structured fashion. They feel they’re denying their dogs the fun and joy of exploring and being dogs, but the reality is that your dog will actually enjoy the walk much more if he’s calm, relaxed, and stress free. We recommend a 90/10 ratio of structure to freedom. Shoot for a 90% structured walk with your dog walking at your side with zero pulling and then 10% of freedom, potty time, and/or sniffing, spread out over the duration of the walk, as a reward for great behavior. If you will set the tone from the beginning of the walk at the thresholds, and then create a respectful, calm, structured walk, you will find your dog becoming a much more relaxed and comfortable dog, who looks to you for information and guidance, and is far better behaved in all other aspects of life, as well. 4) Thou shall always supervise and direct the interactions of dogs who are new to each other. In the previous post, we learned that allowing dogs to work their relationships issues out on their own can be a recipe for disaster. Because there are so many variables and dynamics at play when dogs are being introduced to each other – territorial issues, excitement issues, competition issues, bad manners, trust issues, owner nervousness, etc – it’s prime time for dogs to make bad choices and create bad blood right from the get-go. So, instead of leaving our dogs to sort things out when the deck is stacked against them, let’s help set them up for success through some simple structure, rules, and guidance. If we will take the time to move slowly, be aware, and to create a calm and relaxed state where both dogs can comfortably get familiar with each other, and over the initial hump of newness, novelty, stress and pressure, we have a great chance to create a harmonious, safe, and happy relationship. Click HERE to read my post that gives step-by-step details of how to create this harmonious introduction. 5) Thou shall utilize the dog park at your (and your dog’s) own risk. We learned in the last post that while dog parks are a really cool idea in theory, unfortunately, the reality can be something very different. Many dogs develop trust issues with other dogs after having been bullied or attacked at the dog park, or off-leash, and this often spills over into creating dog reactivity and dog aggression issues down the line. Personally, I don’t ever go into dog parks, and I recommend my clients avoid them as well. My suggestion is to find safe, balanced dogs that your dog can play with – create play dates with friends or neighbors who have good dogs, or take hikes or other excursions off-leash in a safe environment. Treadmills can be a great addition for helping higher energy dogs to expend some of that energy. Bike rides or jogging with your dogs are also awesome activities. When you arrive, check out the vibe: Is it chaotic, are there too many dogs in a frenzied state? Are there any dogs who are engaging in bullying behavior or anything else that makes you nervous? If so, honor that feeling and skip the park or wait until later. Having a rock solid recall on your own dog gives you a big edge in being able to manage and mitigate trouble. If your dog is being chased or bullied and appears nervous, insecure, or that the play doesn’t appear reciprocal, calmly go and intercept and get him/her out of there. A Pet Convincer is an awesome tool for helping with situations that could be problematic at the dog park – like interrupting an escalation or breaking up a fight. Monitor the situation as you would if kids we’re playing or wrestling. Don’t allow things to continuously escalate and intensify – these escalated intensity/adrenaline moments are the perfect opportunity for trouble to break out. Work to maintain a fun but in-control vibe. Remember, it’s your job to advocate and protect your dog. Many owners use the dog park as a place for their ill-behaved dogs to run wild, and many other owners are totally unaware of what their dog is capable of and may not even be aware that their dog is dangerous. Once again, I don’t recommend the dog park, but if you going to use it, be sure to be as safe, aware, and prepared as possible. 6) Thou shall use a calm and relaxed tone and energy when interacting with and correcting your dog. In the previous post, I talked about the fallout that can occur when we use raised voices, anger, or emotional intensity in our interactions with our dogs, and how it’s the natural by-product of the frustration that occurs when we don’t use proper tools and strategy that let us communicate effectively. As a trainer, I see this all the time: Good, smart, emotionally-balanced people losing their cool and falling apart because they feel that they have no other way to effectively communicate and control their dog. I also remember how I would lose MY cool back in the days before I had any understanding of training or tools – it wasn’t fun or pretty. The good news is that this is easily avoided and/or rectified by utilizing some simple training concepts and using tools that empower you. If you’ve been to my website or Facebook page, you know I’m a huge advocate of prong collars. I know many people have strong feelings about them, and that’s okay, but as someone who’s tried most of the methods and tools out there, and who’s only goal is to help the average dog owner be successful, I’ve found few things that are able to turn an unhappy, frustrating, and dangerous dynamic around as quickly and effectively as a well-used prong collar. It’s also extremely safe and very easy to use. So I almost always recommend owners who are struggling start here. Another part of the problem that leads to crazy owner syndrome is not using tools that help inside the house. As owners we instinctively understand that we need a leash and collar to safely control our dogs outside on walks, but for some reason (and trust me, I was included in this group some years ago!) we don’t think to put a leash on in the house to help us direct, control, and train them. So our dogs run roughshod over us and everything else in the house. They bark, jump, mouth, destroy, and drive us nuts – and we, because we have no ability to control them without tools, lose our minds, yell, fuss, and fume. Most owners would be astounded by how much the “crazy” factor – for you and your dog! – is eliminated by simply leaving a leash and training collar on your dog in the house, and having the most rudimentary grasp of training skills on board. Suddenly you have the ability to give information, give direction, and also give corrections if needed, all without raising your voice or losing your cool. How cool is that? When we have tools that work and empower us, communication that is valuable, and dogs that actually listen and are safely controlled, we’re able to stay calm, relaxed, and emotionally balanced. 7) Thou shall pick a dog who’s physical energy and state of mind is compatible with your own. In the 10 “Don’t”s, we learned about all of the possible fallout when humans and dogs start off with physical (energy) or mental (attitude/demeanor) incompatibility issues. When these divides are great, the outcomes are oftentimes frustrating, sad, and heartbreaking. The best way to avoid this unhappy situation is to become highly conscious of finding a dog that is a good match in both temperament and energy levels. If you’re a highly active person (think hiking, running, adventuring etc), then a high energy dog can be a great fit. If you tend toward quiet, low-energy activities (think reading, web surfing, gardening, and relaxing walks), then a lower energy dog who will be comfortable in a lower gear would be a great fit. Imagine putting runner Usain Bolt in an office cubicle for eight hours a day and you can probably picture not only the frustration, but the lack of fulfillment and sadness that would occur. Athletic dogs need an athletic lifestyle – to choose one and not provide that lifestyle is dooming your dog and yourself to a very unhappy existence. This existence usually looks like barking, destruction, escaping, obsessive behavior etc. The other factor to consider, and one that can be harder to gauge, is mental disposition. Dogs, like people, come with all different types of attitudes and dispositions. You can have assertive golden retrievers and sweet, soft German Shepherds. Of course there are breed tendencies, but what I’m suggesting is that you focus less on breed and more on individual attitude/demeanor of the dog in front of you. A soft owner, a laid-back owner, an emotionally-fragile owner, or a sweet and overly-loving owner can all get themselves into serious trouble if they’re attempting to cohabitate with an assertive, confident, bratty, or otherwise strong-minded dog. When dogs feel a serious assertiveness/strength/leadership discrepancy between themselves and the human that thinks they’re in charge of setting rules and limits for them, you can see major friction arise. Some of the behaviors that can manifest from this friction are: resource guarding, bullying, territorial/protective issues, dog aggression, limits/rules being set on humans, and of course biting, if the human makes the mistake of breaking these rules or pushing these limits. Knowing all this, be sure to carefully observe the dog you’re thinking about adding to your life. Watch for the attitude behind the cute exterior. Does the dog “feel” assertive, bratty, pushy, or stubborn? If so, honor that. We’re able to easily sense these traits in people, but we often let the cuteness and love of dogs obscure our animal ability to objectively assess dog-attitude. Instead, check in with your inner human animal and let it tell you how the dog’s attitude and demeanor “feels” to you. At the end if the day, it’s all about compatibility. If you’re a softie, try to find a softer dog; if you’re confident and assertive, you have more leeway to work with firmer dogs. If you’re a couch potato, try to find a low-key, chilled out dog; and if you’re a high energy, action person, go find yourself a suitable partner in crime. Remember, to think that dogs are a one-size-fits-all is a recipe for struggle and heartache. 8) Thou shall always have control of your off-leash dog and prevent him from harassing other dogs and owners. Train your dog! Work on creating a bombproof recall at the very least. You can train this with a long line and training collar, with treats and toys if your dog is super mild and motivated, or the best and most dependable suggestion – E-collar recall. E-collar or remote-collar trained recall is the closest thing to 100% recall there is. If training isn’t your bag, then invest in a simple long line. You can get them from Amazon or Petco for a few bucks, and you can get 15, 25, or 50 feet lengths. This way you have freedom for you and your dog, but still some control. This doesn’t guarantee your dog will come when called, but it offers a much higher level of control and safety. Most importantly, I want you to simply be aware that even if you have a friendly, easy-going dog, many other owners aren’t lucky enough to be in the same position. Ignoring this reality, and allowing your dog to pressure and stress out other dogs and owners is highly disrespectful and irresponsible. Your fellow dog owners and their dog’s comfort, security, and enjoyment is just as important as yours. So get that dog trained, get him under control, or get him on a leash or long line. 9) Thou shall honor your dog at the highest level and keep him balanced and healthy by treating him like a dog and not a human. In the previous post we talked about how indulging ourselves – sharing too much unearned affection, humanizing and babying our dogs, and not sharing the necessary structure, rules, and guidance – while feeling awesome for us, is almost always the greatest contributing factor to bad behavior and uncomfortable and unhappy dogs. As a professional trainer, I see this one almost constantly – and attempting to repair the behavioral fallout that occurs from it is a daily focus. When we baby, spoil and humanize, we not only create bratty and entitled dogs, but we also create stressed, anxious, and overwhelmed dogs. When dogs feel like they’re without a strong, guiding presence in their world to lean and depend on, they begin to take on more responsibility and stress, and serious behavioral issues are often the result. So what’s a conscientious dog owner to do? First, just becoming aware of the reality of this dynamic and the power of our affection and interactions is a good start. Understanding that our affection can be used to both help or harm, and then being mindful of wielding that power wisely is where we need to go. And it’s not about one or the other – affection or discipline, all or nothing – no, it’s all about balance. It’s about being as believable in your discipline as you are in your affection. It’s about being able to gift your dog with guidance that is as fluid as the real world is. We need to be able move between both worlds of lover and leader effortlessly and intelligently, being mindful to correct negative, unwanted behavior effectively and convincingly, and reward positive, healthy behavior. This doesn’t mean reward for every simple action your dog makes that isn’t negative!! Like anything else, that which is too easily obtained is not valued or appreciated. And if you reward constantly, and for everything, your dog will see you as needy, soft, and not to be followed – and he will likely become spoiled and entitled – expecting the world to revolve around him. A great approach to keep things between you and your dog on the harmonious path is to use obedience commands to have your dog work for your attention, for food, and for other valued interactions. This is a simple and effective strategy to help keep your relationship in balance and ensure your dog is in a heathy frame of mind, seeing resources comes from you at your discretion, and patterning a healthy habit of respectful, obedient behavior. A quick reminder! Be sure that you are the one who sets up these interactions, not your dog. In other words, you decide when to give affection, not your dog. You decide when feeding/treat time is, not your dog. Remember, what your dog needs and wants most is a balanced world where you fulfills all his needs – his need for structure, leadership, rules, discipline, guidance, play, adventure, exercise, and love. When you truly care and are truly aware, you doesn’t just share the stuff that is fun, fulfilling, and pleasurable for yourself – you also share the stuff that is sometimes hard, sometimes not easy, and sometimes not fun. That’s the true responsibility of raising dogs. That to me is real love. 10) Thou shall appreciate and cultivate your dog’s ability to be quiet, still, and relaxed. Okay, so in the last post, we talked about how many people mistake excited behavior for happiness and calm behavior for sadness. We also talked about how dogs that live in a perpetual state of excitement and adrenaline tend to be stressed and anxious and almost always have behavioral issues as a result. These issues can run the gamut, from mildly annoying, to the very serious and dangerous. So if we understand that excitement, adrenaline, stress, and anxiety are actually where problem behaviors come from, and that calm, relaxed, stress-free dogs tend to make great choices on their own, we can hopefully see the value in perceiving these states for what they truly are rather than what human emotions we project onto them. Of course, I’m not suggesting that every dog who is excited is stressed, or that every dog should be constantly calm and chilled out – absolutely not – but dogs who live in constant motion and who are unable to access calm and stillness when requested, are often dogs in trouble. So the only action step needed for this commandment is a perspective and awareness shift. Once you understand that many of the behaviors we associate with happiness are actually stress and anxiety, and many of the behaviors we associate with sadness are actually calm, relaxation, we can start to feel differently about what we’re seeing from our dogs. With this understanding, we can also start to prioritize some activities and exercises that actually condition our dogs to comfortably access both the active world and the still world, and in doing so, cultivate better mental health and stability. Read about this simple but incredibly powerful exercise that will teach your dog how to be calm, relaxed, and comfortable in a chaotic world HERE.